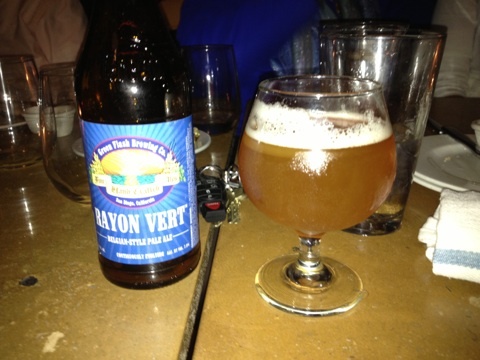 Google Translator confirms what my six years of French tutelage told me – Rayon Vert means Green Ray. No, I’m not talking about a Jules Verne novel. 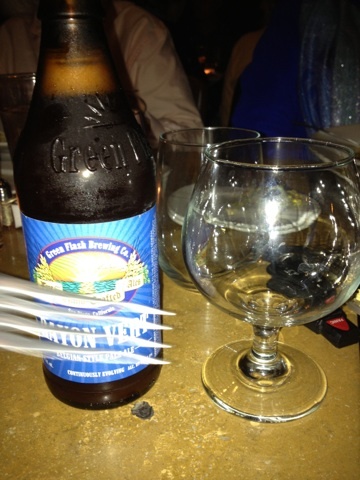 I’m referring to the fabulous Belgian Ale by the Greenflash Brewery, Rayon Vert. 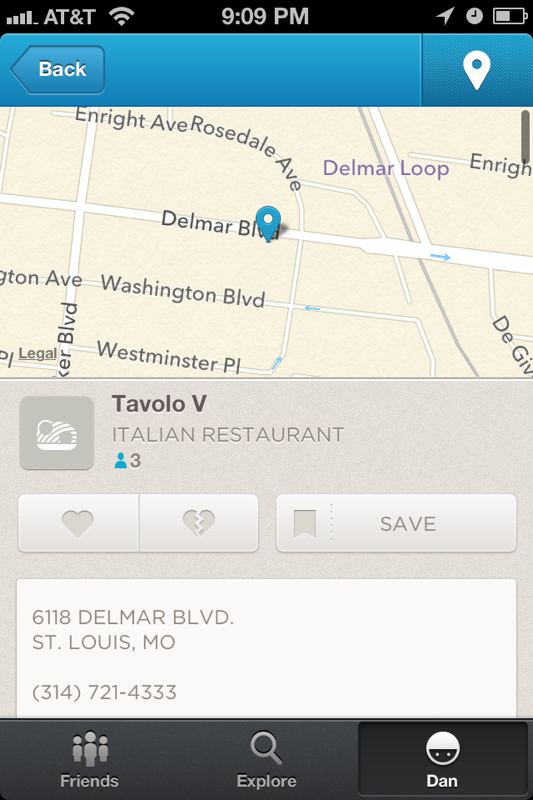 Their IPA came across my radar a few months ago in this blog’s infancy, and now like a green laser beam the Rayon Vert greets me whilst out for a birthday dinner with my family at Tavolo V in the St. Louis Loop. What a nice photogr… dammit. My dad thought it would be oh so hilarious to “Fork Bomb” my photo of the beer and it’s glass just as the iPhone camera clicked. Thanks, Pop. At a hearty 7.0%, this is a perfect follow up to my Goose Island Matilda Belgian Ale, of equally potent ABV. I picked up on some very fruity hoppy flavors, reminiscent of a classic Belgian Ale. I dare say that I prefer this to the Matilda, but that might be considered heresy. The flavor is very distinct and enjoyable, with a crisp bubbly palate. More aromatic and flavorful than hoppy, but the hops shine though and provide flowery fruity tastes that complement the robust flavors of the grains. Complex yet simple… a damned fine beer. What did I have for dinner? 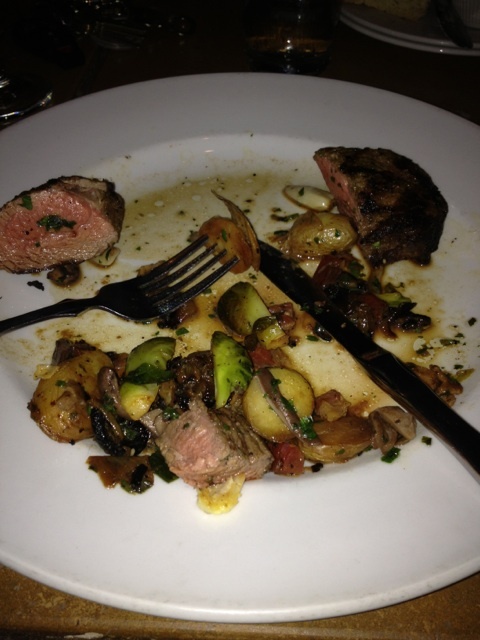 It was so friggin’ good that I forgot to take a picture until it was half gone. I present the bistro filet (a tenderloin of beef shoulder), atop a medley of sauteed potatoes, brussels sprouts, pork belly, garlic, and onions. Butter was also present, I believe. Medium rare, of course. A spectacular meal accompanied by wonderful beers in the presence of my loving and caring family, including my father, who picked up the tab.